Insulation Systems: Doomed from the Start? Properly installed mechanical insulation works. Numerous articles cite its effectiveness. Insulation users have free access to the North American Insulation Manufacturers Association (NAIMA) 3E-Plus® insulation program, which allows them to determine the most cost-effective materials and thicknesses for the service required. So why do so many insulation projects fail? The question of why so many insulation projects fail came up during a National Insulation Association (NIA) meeting last fall, and a few of the contractors in attendance decided to look into the problem. They found that many insulation projects—in both the industrial and commercial sectors—are doomed from the very beginning. The question is, Why? Part of the problem is that insulation is the forgotten technology. It is an afterthought—at least until condensation begins and mold starts to show on ceilings and walls, or until the plant process does not function properly. At that point, then, insulation becomes extremely important. There are several issues involved in an average mechanical insulation system for industrial and commercial projects. One problem for both types begins with the design/build or general contractor trying to get the initial construction cost reduced. Projects frequently run over budget. Insulation contractors are then asked to “value engineer” the insulation to help reduce the project install cost. In this context, value engineering typically involves reducing the insulation thickness, changing the type of insulation used to a cheaper material, or eliminating systems from being insulated. The truth about mechanical insulation is that to really value engineer it, users should install more insulation on most systems, not less. Mechanical insulation will put money in the owner’s pocket from the first time the system is energized until the materials are removed or the system is shut off. By value engineering a thicker material on more systems, owners can reduce the energy used, greenhouse gas (GHG) emissions, and the overall cost of operating the facility. Unfortunately, insulation contractors are placed in a competitive situation; they know that if they do not get creative to value engineer the project, a competitor will. On industrial projects, the insulation contractor is usually involved with the owner from the beginning and frequently works directly for the owner. The insulation contractor is at the table discussing the insulation needs and any problems that may come up during construction. Being this close to the owner is incredibly beneficial to the project. If contractors see a potential problem, they can take it to the top. Owners are likely to correct the problem because they want the plant to run properly after start-up. 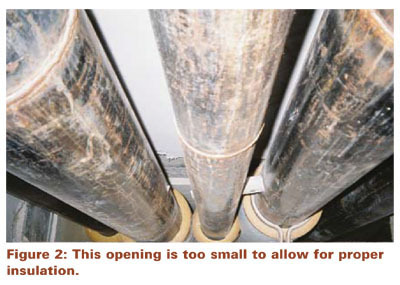 The types of problems encountered on industrial projects run from improper materials specified for the service to pipe systems installed without adequate clearance and a lack of care in determining high abuse areas of the plant that require a different material. The materials and finishes are usually specified by a design engineering firm that tends to be more cognizant of the needs of the specific plant and system. The insulation contractor can offer assistance with regard to materials that will take more abuse, finishes that will hold up better under operating conditions, and installation problems regarding clearance for proper thicknesses to be installed. Weather conditions can be important in the application of mechanical insulation. Proper protection of insulation materials is one of the most significant needs of the industrial system. If the weather is inclement during installation, the process is usually stopped. 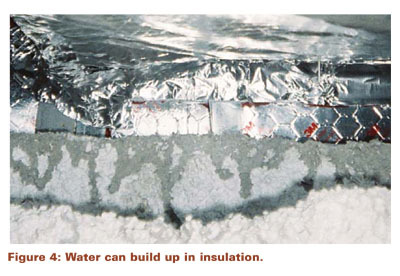 Proper installation of weatherproofing material ensures that water sheds away from the insulation. If conditions do not allow for proper water shed, the insulation contractor can go to the owner for an immediate solution. Industrial projects have fewer problems because insulation is not usually forgotten. As noted earlier, the owner and the insulation contractor can discuss any potential problems directly, and the design team takes the time to specify proper insulation materials in proper thicknesses from the beginning. If this is not the case, any problems still can be rectified quickly because the owner and the contractor are working together. If problems are not addressed by the owner, however, the system may fail. On commercial projects, the insulation contractor seldom even knows who the owner is. The insulation contractor is a third-tier contractor who works for a mechanical contractor who works for a general contractor who works for the owner or an owner’s representative. 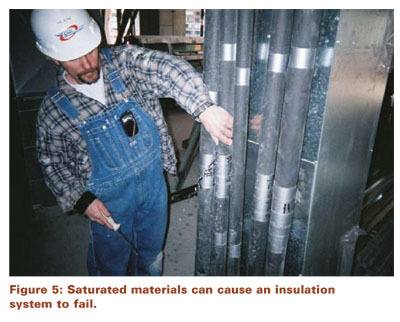 This helps explain why mechanical insulation is a forgotten technology on commercial projects. Owners have no idea what kind of mechanical insulation service they are purchasing for their buildings. Insulation suddenly comes to light when there is a failure; when the owner receives the first energy bill; when mold begins to grow on the insulation, ceilings, or walls; or when there is not enough heating or cooling in a specific area of the building. Then, mechanical insulation starts to seem very important. 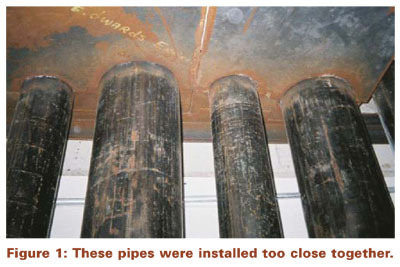 The pipes were too close together to allow for proper insulation thickness. Insulation was installed prior to the exterior envelope being completed. The control and shutoff valves were installed too close together to allow for proper insulation thickness. Drain pans were clogged and overflowing. The chilled water ran 4 degrees cooler than anticipated. The air-handling units for the halls and common spaces were inadequate to remove enough moisture from the air. While the building was under construction, the marching orders were to “just get it done.” If there was too little room for the proper insulation thickness, they were to “just put on what you can.” If rain and moisture came into the building, they were to “just get it done and the material will dry out.” The dormitory had to close for several months while the repairs were being completed. Another example is a hospital fresh air intake system that had condensation forming on the outside of the blanket insulation, as well as between the sheet metal and the fiberglass insulation material. A 1½-inch-thick, ¾-pound-density fiberglass blanket material was specified for this portion of the system. The geographic area of the institution frequently experiences temperatures of -15° to -20°F outside air during the winter. Drawing this cold air into the warm building caused significant condensation problems. The only place this failure occurred was where the blanket was specified and installed. Portions of the system had 1½-inch-thick, 3-pound-density fiberglass board specified, and those portions worked very well. The reason the board product worked and the blanket did not is that the “k-factor” of the blanket is .31 at 100 degrees and the k-factor for the board is .24 at 100 degrees. Simply put, the board is a better insulator than the blanket. In the areas where blanket was used, thousands of square feet of material—much of it behind walls—will have to be changed to rectify the problem. In another example, a high-rise building has hundreds of stacked fan coil units. The units have a four-pipe system: two hot water and two chilled water pipes, and a drain. The risers purchased by the mechanical contractor were pre-insulated with 1/2-inch-thick elastomeric material. The mechanical contractor installed the riser pipe prior to the windows and roof being installed on the building. Rain and snow permeated the building from the unfinished floors above to all of the pre-insulated risers below. The insulation contractor was to complete the insulation at the tie-ins for each unit. The insulation on the risers held so much water that, when cut with a knife, water ran out like a faucet. The mechanical contractor insisted the products would dry out and instructed the insulation contractor to continue the work at the tie-ins and leave the pre-insulated system in place. Most of these problems are “solved” in the field by the insulation contractor. Many times, mechanical or general contractors do not want to hear about insulation problems—that is, until there is a failure. If insulation contractors complain about the pipes being too close together, they are complaining about their customer, the mechanical contractor. If they bring up the size of the core in the floor, they are complaining about the general contractor or, in some cases, the mechanical contractor again. In many cases, the insulation contractor is successful in getting creative and solving the problems. When insulation contractors are not successful, however, they are usually held responsible for the problems. This puts them in a difficult position. The largest mechanical service in most buildings is the ventilation service or the sheet-metal duct system. Sheet metal requires the most room and often is shown on drawings as a single line. When ventilation contractors start the installation, they often find that there is not enough room. Adjustments are made, and space configurations are compromised. Initially, there was enough room for the duct and the pipe, but the duct and the pipe have to be insulated. If adjustments are not made, the insulation system is likely to fail. Valves, elbows, circuit setters, balancing valves, victaulic couplings, and other pipe appurtenances are regularly installed too close to each other. As a result, they do not allow for proper insulation thickness or vapor barrier. Ball valves on pipe systems that require 2 inches of insulation are installed without the valve arm extension. The insulation must be cut away to allow for valve operation. 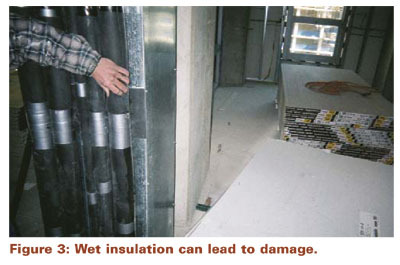 The thickness of the material, as well as the vapor barrier, is compromised. These control devices are required for the operation of the fan coils and unit heaters. When they are installed too close together to allow for proper insulation thickness, the system will fail. In many cases, the coil connections are designed with the in and out ports so close together that the proper thickness of insulation cannot be installed. This usually requires a decrease in thickness of material or a change of specified material. If the material has to be altered to “make it work,” the system may not work for long. Chilled water systems that are mounted with clamps to unistrut-type trapeze hangers always will be a point of failure. The very thin material that separates the clamp from the pipe is not an insulator. It is designed to separate the clamp, usually made of galvanized metal, from the pipe, usually made of copper. Many devices are manufactured to allow for proper insulation of these clamps as they are mounted to the trapeze. If the general and/or mechanical contractor does not want to pay for such devices, however, the insulation contractor must try to adjust the system. Insulation specifications should be updated periodically to ensure that the documents are current with the materials and technology available. Higher fuel prices and new forms of insulation make it mandatory for architects and engineers to pay particular attention to their specifications and update them to reflect the current needs and available materials. Improper insulation specifications occur too frequently. Architects and engineers should use the 3E Plus program when they have doubts about the insulation needs of their projects. The 3E Plus software program relates to fiber materials only, and engineers should be aware of the cellular glass and closed-cell materials that are available to help solve insulation problems. Keep in mind that the insulation contractor is generally far removed from the decision makers. Insulation contractors should notify, in writing, the general contractor, mechanical contractor, engineer, architect, and building owner when problems arise on commercial buildings. The attitude toward insulation problems hopefully will change as more awareness spreads. Engineers and architects can look for conditions that restrict the proper installation of insulation materials and take actions to correct them. Most insulation issues can be rectified when the parties involved are motivated to solve them.